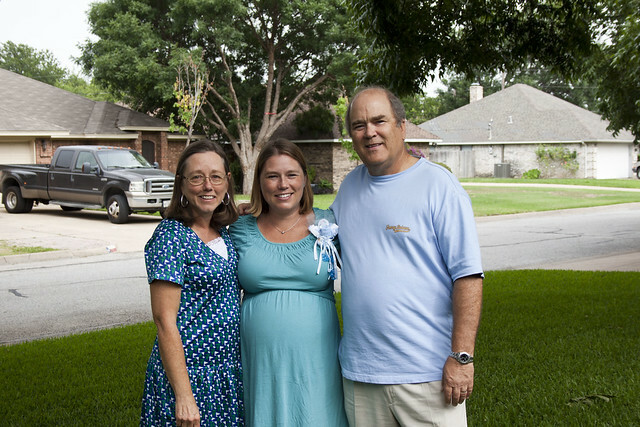 Taken a week ago at my parent’s house at one of Teddy’s baby showers that was held over that weekend. Late 29 weeks pregnant here. Y’all. I’m officially counting down the weeks now. I can’t believe that I have just July and August to get through and then Teddy will be here! At least, of course, if he arrives around the 40 week mark instead of coming early or lingering in a little late. I like that first week of September so let’s still stick with that, baby boy! Within the last two weeks the emotional side of the third trimester has really kicked in. Crying over just about anything can easily happen now and there’s nothing more frustrating than being told not to cry. Well, too bad, it’s happening and sometimes it feels cathartic to just let it all out. Along with the emotional side of things has come more heartburn and a reluctancy to want to eat Mexican and Italian foods. That just leads to sleeping poorly since I have to sleep semi-elevated and attempt to keep myself from lying on my back. I love the nights when I can lay down completely flat and experience no reflux. Other interesting things I’m finding is that my belly now touches my lap if I sit down, breathing is getting more difficult, and I can’t eat nearly as much since there seems to be no room for my stomach. Oh, and bending over and getting up from sitting down requires a lot more effort. I still can touch my toes without bending my knees but that’s becoming more difficult with a growing belly to contend with. I’m experiencing some swelling if I stand on my feet too long and paired with the heat I tend to need to get off my feet as soon as I can in the evenings after getting chores done around the house and yard. I put off some of the reading I had been doing regarding pregnancy, childbirth, and breastfeeding, and have switched to some good old fashioned fiction in the form of the newest Diana Gabaldon novel. The last novel came out in 2009 so needless to say it was about time for some time with my favorite time-traveling family! I need to pick up the La Leche League breastfeeding book again soon. The most interesting thing in the last few weeks has been the pick up in movement with Teddy as well as feeling different parts of his body as he pushes up against my belly. Sometimes the way he moves can be extremely uncomfortable but most of the time it is fascinating and interesting to feel. After perusing the Spinning Babies website regarding baby positioning, I believe he bounces between left occciput transverse (LOT) and left occiput anterior (LOA). As those are good positions to be in for starting labor I hope he stays that way and doesn’t switch to posterior or even breech in the next 9 weeks! My focus in the next 9 weeks is to get back on track with my Bradley Method exercises and relaxation practice, and getting back into walking again. It’s so hot and humid these days that I’m having to walk later in the evenings, but I really feel the need to be walking. I’m actually looking forward to being able to run and do heavy cardio this fall! I guess that’s about it for now. I generally have a lot of rambling and incoherent thoughts throughout the day that I’ve been meaning to write down so I should probably start taking those notes so I can remember all of the little things I worry about or dream about.